I'm delighted to showcase the nine authors who collaborated with me on OPEN MIC: RIFFS ON LIFE BETWEEN CULTURES IN TEN VOICES (published by Candlewick Press). Today I'm featuring the winner of an open call for contributors, where we sought entries far and wide for the anthology. Debbie Rigaud's "Voilà" won that contest. "... Open Mic is not a collection of spoken-word poetry, as you might expect, but it is every bit as spirited as a live performance. Ten YA authors contributed fiction and nonfiction pieces that depict slices of life as a racial minority in America, and their stories are funny, touching, and inventive by turns ... 'Voilà,' Debbie Rigaud's short story about a Haitian American girl taking her grandmother to the "ghetto doctor" (and the tiresome white teenagers who are there as volunteers) is rendered in beautiful language and tender sentiment..."
...When I was little, my great-aunt Ma Tante used to feed me breakfast. That was when she had a straight back—so long ago, I wasn't wearing glasses yet, if you can imagine. I must have been about three. My parents were at work, my big sister at school, so it was just Ma Tante and me. As she dipped my bread in coffee, I got distracted by tiny particles floating in the beam of light entering the window above the kitchen sink. Ma Tante, ever vigilant of my feelings, asked what I was staring at. The peanut-butter-lathered bread I had been chewing stalled in the crook of my cheek. I pointed to the snowfall of particles. It seemed like the most magical thing I'd ever seen. Ma Tante smiled. "Magical, non?" she asked, echoing my thoughts. "Things are always floating around us. But just like that sunbeam, ti takes the light in our hearts to see magic that is invisible to most people." 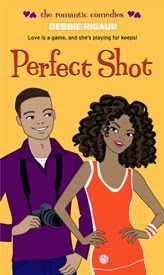 Debbie's books include Perfect Shot and Hallway Diaries, and she has written for Entertainment Weekly, Seventeen, Vibe, Cosmo Girl!, Essence, and other magazines. She lives and writes in Bermuda. Find out more about Debbie and her work here.